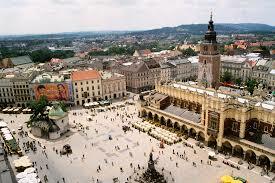 1) Krakow has a large International Airport with easy access to the US or other European Cities. (You may also find the flight less expensive then returning from Vienna). 2) Avoiding the long drive back to Bratislava or Vienna gives the group more time to explore Bardejov and Slovakia’s Pieniny Mountain region (2 hours from Krakow) and the trans-Carpathian region. Slovakia’s beautiful Pieniny region on the Polish border. 3. It gives people an option to extend their visit in Krakow or other parts of Poland. Our trip will include a morning city tour of Wawel Castle and important sites in the old city, with afternoon free time for further exploration. Krakow easily warrants extending your visit another day or two to visit some of the nearby sites: Auschwitz-Birkenau Concentration Camps; the Wieliczka Salt Mines; the Cathedral and residence of Pope John the Second, who was the Archbishop of Krakow when he was elected Pope; the Black Madonna of Czestochowa; Oskar Schindler’s Factory and many more important sites. Stroll Prague’s ancient streets and cross the Charles River. Take an afternoon trip to the incredible Wieliczka Saltmines outside of Krakow. Pope John II was the Cardinal of Krakow and has left a legacy in the city. We hope you’ll join us for the 2014 Slovakia Heritage Tour and discover the Krakow connection for yourself. I went on the 2013 Slovakia tour and added Krakow as an extension. Krakow is a beautiful city not to be missed, especially when you are so close. Krakow survived WWII leaving it physically as it was centuries ago. You feel like you are walking back in time. Some of our group, like myself, had Slovak/Polish ancestory making it even more relevant. I am very happy to see the Best of Slovakia tours will finish in Krakow in 2014. Previous Previous post: Share our 2014 Flyer!